The cloud is a huge change in data center strategy, and more and more companies are taking advantage of it. Unfortunately, they're still using the same security strategies as before. An on-prem approach to data security is ill-equipped to address the security needs of the cloud and, worse yet, actually undermines the reasons you went to the cloud in the first place. To properly protect the cloud, you need a solution built for the cloud. Security as a Service can help your business protect its technology assets and make the most of its cloud deployment. 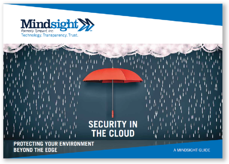 Download your guide to Security in the Cloud today.